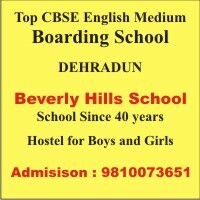 The School Provides Facilities for football, basketball, badminton, cricket, table tennis, chess, trekking, athletics, boxing, track & field events, cycling and cross-country running Set in the backdrop of the Himalayan Range in the Doon Valley, CARMAN was founded on the 3rd of March 1960 by Mr. and Mrs. I.L..G. Mann.It is run under the management of a Board of Governors. It is an Institution recognised by the Government as a Co-Educational Anglo Indian Institution and is open to all Nationalities, casts and creeds without any reservation. The school is affiliated to the Council for the Indian School Certificate Examinations, New Delhi.We nurture children's natural intellectual curiosity while helping each student achieve high academic standards. We value community involvement & celebrate diversity by building on the strong contributions of each child & family. Our Aim Education in the true sense in something more than textbooks, examinations and degrees. It is the basic foundation on which men and women of tomorrow prepare to meet the challenges of a complex and ever changing world. It is with this belief that CARMAN endeavors to give students a second value based education that will prepare them for life.